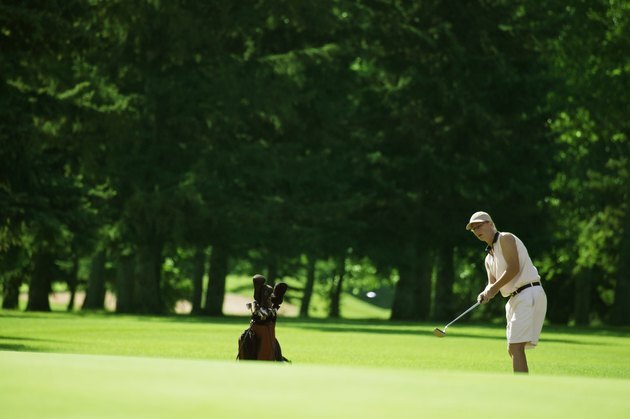 Golf is a form of physical activity as well as social activity. Many patients who have undergone or are considering undergoing a total knee replacement desire to return to golf. A total knee replacement is recommended to patients with severe pain, chronic inflammation, knee deformity and to those who have not responded well to conservative treatments such as pain medications or physical therapy. Knee replacements often occur as the result of arthritis, which ruins the cartilage of the knee. With the permission of your doctor and slight modification to your golf game, you can play golf after knee replacement surgery. Take advantage of golf carts to get around for the first couple of months after your doctor clears your to play following your knee replacement surgery. After your knee has completely healed, begin walking the course. Have a caddy or friend lift and carry your golf bag. This can help reduce stress placed on your knee by heavy lifting. Wear shoes without spikes. Shoes with spikes fix your stance as you swing. This can increase rotational stress on an artificial knee. Swing while you are elevated slightly on your toes -- your heels should come off the ground as you swing. If you swing flat-footed, you are placing excessive stress on your knees. Golfers with a left knee replacement should avoid stepping through a swing; this can lead to excessive weight placement on the left knee. Right-handed golfers who have undergone a left total knee replacement should try playing with an open stance. This prevents the hips from turning during a swing, which can reduce stress on the left knee. Avoid playing golf when the grass is wet. This can increase your chances of slipping and causing damage to your new knee.